* an Art Nouveau style salon from the turn of 19th and 20th centuries. In every age there was a correlation between the interior design, architecture and architectural details. That is why exhibitions presented in a Baroque palace could not be a faithful reconstruction. Merely an attempt to restore the characteristics and mood of given premises has been made through the proper selection of everyday objects and their arrangement. 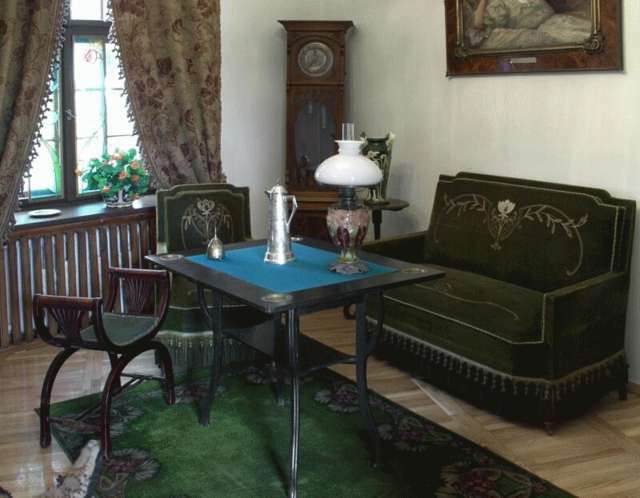 The objects presented in the exhibition come from the circles of rich bourgeoisie and aristocratic residences. Their great diversity is dominated by furniture, performing the basic functions in the interiors. The emotional relationship between man and object, various family heirlooms, as well as awareness of their material value meant that apartments equipped with household items uniform in style were a rarity. Therefore, the ability to combine various elements of interior design and equipment into a harmonious whole and to give it an original, personal imprint was an important thing. The social and financial status of the owners, and above all their personality and aesthetic sensitivity were also very important.